I have a friend, Carol, who lives on the other side of Canada. We are pretty much as far apart as we can be and still live in the same country. We met when we both lived in Igloolik, a tiny town in Canada's arctic, more than 10 years ago. When she left Igloolik we agreed to write letters, which is the only way we keep in touch (though I think she reads my devotions here too...Hi, Carol!). She's the only person I exchange letters with and it's always a thrill to open the mailbox and see an envelope decorated with the little flower she draws. Though I am often slow to write when it's my turn, I never start a letter to Carol feeling that it's a chore, as in "Ugh, I have to write to her, but that's the last thing I want to do." Not at all! I enjoy writing those letters, sharing little snippets of what life is like for us here, what I'm up to and what everyone else is doing, how the boys are changing as they get older. I enjoy reading her letters for the same reason. It's fun to read about their family activities and about how her three kids are changing as they grow up. The pictures she sometimes sends are fun too! These letters back and forth are important to me because her friendship is important to me and the letters are how we continue to know each other. I've heard the Bible referred to as a letter to us from God. Though He did not write it with His own hand, "all Scripture is God-breathed" (2 Timothy 3:16,17), meaning that He inspired the various writers with what He wanted them to say. And just as with my letters to Carol, God wrote to us because He wants a relationship with us. 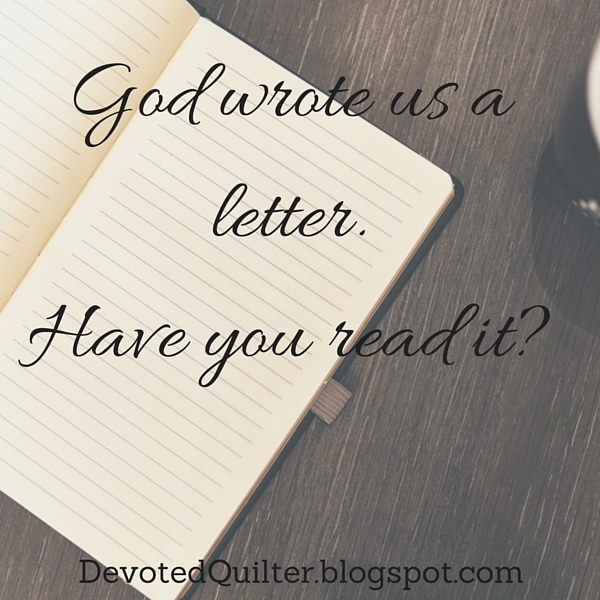 He didn't have to write to us, but He chose to send us a letter so that we could know Him. John 1:10-23 - "He was in the world, and though the world was made through him, the world did not recognize him. He came to that which was his own, but his own did not receive him. Yet to all who did receive him, to those who believed in his name, he gave the right to become children of God— children born not of natural descent, nor of human decision or a husband’s will, but born of God." Revelation 3:20 - "Here I am! I stand at the door and knock. If anyone hears my voice and opens the door, I will come in and eat with that person, and they with me." 1 John 3:1 - "See what great love the Father has lavished on us, that we should be called children of God! And that is what we are! The reason the world does not know us is that it did not know him." God loves us! He loves us so much that He sent Jesus to restore our relationship with Him. He also wrote us this letter telling us about Himself, about how much He loves us and how to live as His children. The only question is, Have you read it? 100,000, Something New and a Surprise!